A single packaged unit used as a backup to the primary inflation source. System includes (1) 24″ inflation fan, internal combustion engine and pre-wired control system. 6,932 cfm @ 1.5″ w.c., 1,176 r.p.m. requires 2.79 bhp. 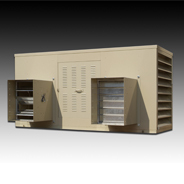 A single packaged unit incorporating both primary and secondary inflation fans, backup power source and pre-wired control system. Call for fan curves for your specific requirements. A single packaged unit incorporating both inflation fan, auxiliary power sourceand pre-wired control system. Motor is a high efficiency ODP type, mounted on adjustable base, with “B” V-belt drives to the fan. Auxilary engine: TEST – AUTO – MAINTENANCE. 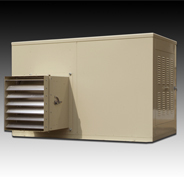 A single packaged unit incorporating both inflation fan, backup power source and pre-wired control system. Shipped fully tested, needs only power and fuel connections to be operational. Emergency engine may be deleted in redundant units when multiple units are used on the same structure.